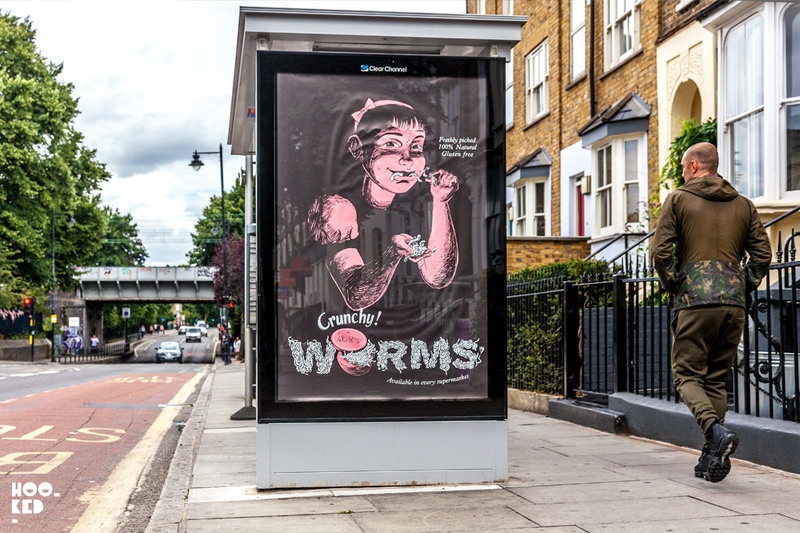 We have been featuring Italian artist HOGRE on the blog for some time now, we stumbled across the artist work last year while travelling on the upper deck of a London bus spotting one of tube artist adbusting poster while we were looking out the window waiting for the bus to love away from the bus stop. We continued to discover the work over the years and shared the work in a number of features on the blog. 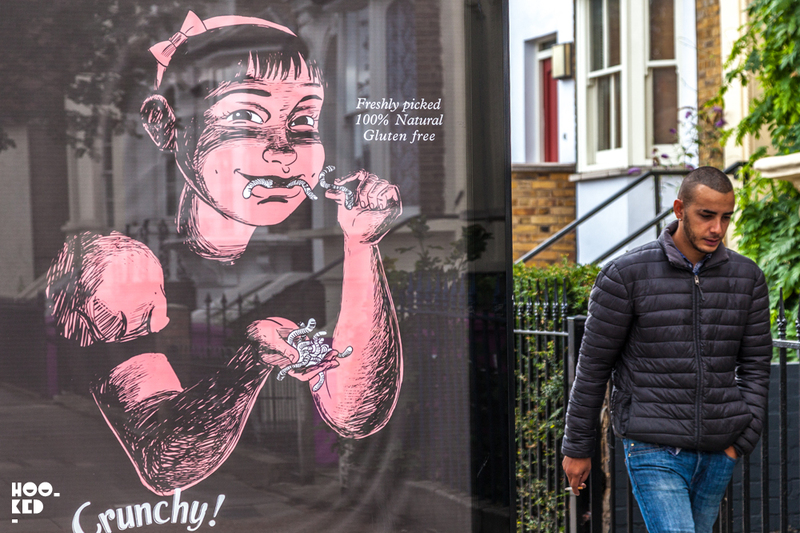 We found ourselves constantly checking the cities adshells on the look out for the artists works which saw him open the ad erosion adahells and swap out the advertising posters with his own artist made to fit the same of the spaces. HOGRE has been pretty prolific in the last year but due to the nature of his adbusting work we we not so lucky to always catch his street works. But lucky for us and you our readers the artist teamed up with independent publishers Dog Section Press earlier in the summer to produce a photographic collection of both the artists outdoor and indoor artworks in a publication titled 'Subvertising, The Piracy of Outdoor Advertising Book'. We featured the publication on the site in a post here and should you not have already done so we highly recommend you pick yourself up a copy of the book online directly from Dog Section Press' online web store. Since discovering the artists work we have been following his output online an after some time back in Italy we spotted he was back in London and out installing works on the streets again. After some digging and google maps detective work we tracked down the location of some of the new HOGRE works pictured here along with the work of artist DoubleWhy who created the 'Crunchy! Worms' piece. See More: Fresh new works by artist HOGRE. 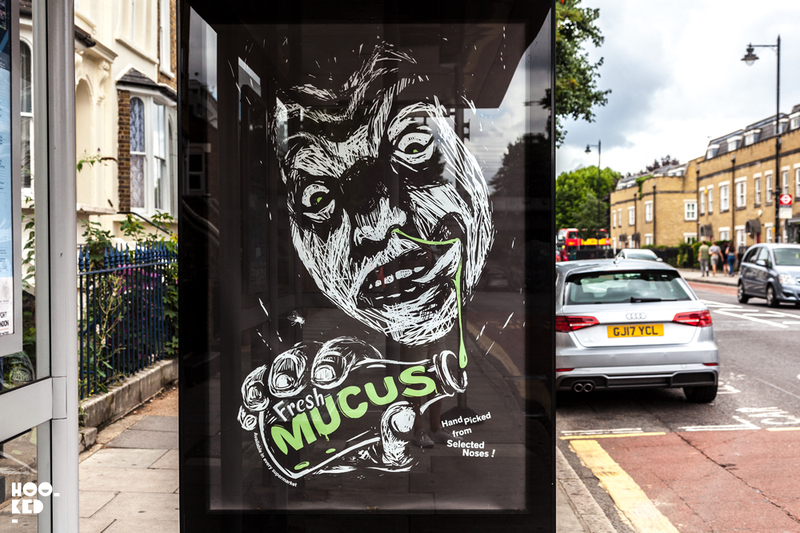 The text on the HOGRE work pictured above reads: FRESH MUCUS — Hand picked from selected noses ! Available in every supermarket. Follow our Hookedblog Pinterest Boards for even more Subvertising. If you would like to see more of the artists work you can following his work online or keep your eyes open on the streets. The latest works featured here were photographed close to Mile End Underground station in London. 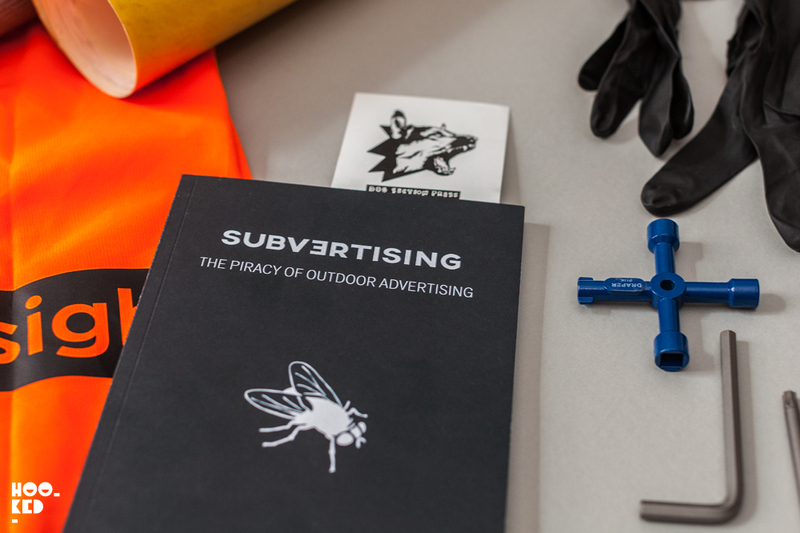 Pictured above is the newest book from HOGRE titled Subvertising, The Piracy of Outdoor Advertising, published by Dog Section Press and if you are interested in picking up a copy we suggest doing so sooner than later. Dog Section Press' previous publication, the excellent 'Advertising Shits In Your Head' (Strategies For Resistance) has already sold out so don't hang about and pick yourself up a copy for £15 from the Dog Section Press webshop. Advertising Shits In Your Head (Strategies For Resistance) Book Release. 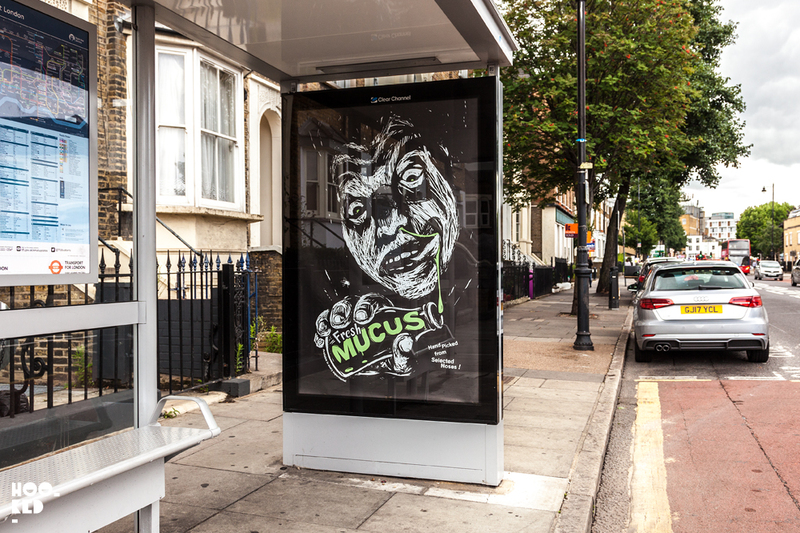 Adbusting with street artist Eyesaw in London, UK. Fresh new works by artist HOGRE.